Work during the first week of the New Year kept me busier than hoped, including a three-day business trip to Singapore. 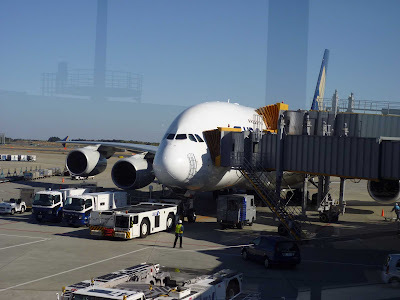 At least I was able to travel in the new business class of Singapore Airlines, their new Airbus 380, which features real flat beds. If only the return trip over night had been a bit longer and less bumpy... Not sure how fit I would be after this exhausting week, I decided it was safer to venture out on my own yesterday. The goal was to discover as many new roads as possible, starting from home. And I got plenty of that. I continued on Setagaya Dori beyond where I usually get onto the Tamasai, continuing basically always straight towards Machida, eventually ending up in Aikawa, the first rural town, lying at the foot of Miyagase Lake. We always approach Miyagase Lake from the north, passing it on its western side to climb up to Yabitsu - or vice versa. This time, I wanted to see what it looked like from the east. 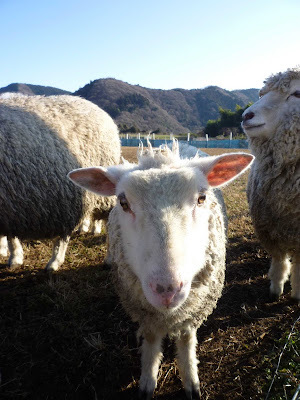 On the way up to the dam, I passed a nice farm. 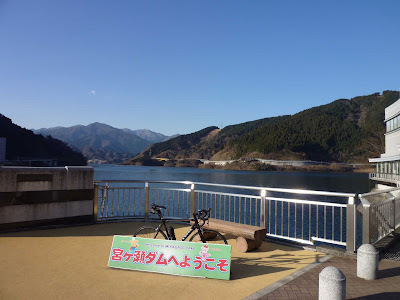 There were nice views from the dam, including of the rest area where we normally stop on the western shore, and of the Tanzawa range behind it. The mountains were lighly covered with snow above 1,000 meters. 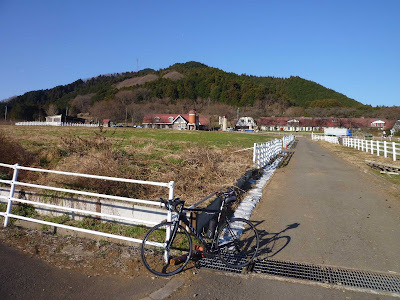 I left for Doshimichi, but instead of going up the new road that we always take, I cycled through the old road leading through the surprisingly large village of Aonehara, and ending just beyond the new Seven-Eleven, which became my first pit stop. I continued on Doshimichi until Nohara, where I turned onto the Nohara Rindo leading up to Gando Toge, which Tom had mentioned recently on his blog. It was a nice climb in the warming sun from 450m to 800m, with great views of the Doshi valley below and Fuji-san. At Gando Toge, I encountered a group of mountain bikers who had just reached the top from the other side and sounded completely exhausted. There was another, obviously much slower, group a few hundred altitude meters below. (These were the only cyclists I saw all day outside urban areas!) If I'm not mistaken, this was the same group of people I had seen earlier in the morning putting their MTBs into vans in front of the Bex Isoya bike shop on Setagaya Dori. If only they knew how I had got to the same spot! I could have continued straight all the way down this valley until reaching the kendo running through Akiyama valley. Instead, I decided to explore another rindo branching off to the west, about two thirds down the descent. This Kanami Rindo led me another 150m up to a Kanami Tunnel at 620m, just below Kanami Toge. It offered nice views of the Akiyama valley. 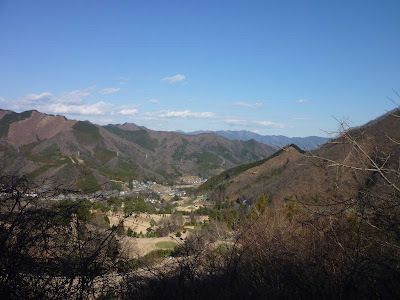 I continued the same rindo for another few kilometers until it led to the kendo going up the Akiyama valley. From there I was again on familiar territory, going up to Hinazuru tunnel and down the other side. Instead of continuing straight to route 139 (or going through Suzugane), I branched off to the south, up another hill of 100m or so to take a short-cut to route 139 running south. 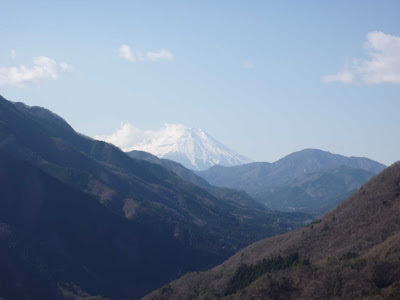 After my second pit-stop at a Seven-Eleven just before hitting route 139, I braved the strong wind blowing against me and the endless chain of cars passing me to battle my way up to Kawaguchiko. 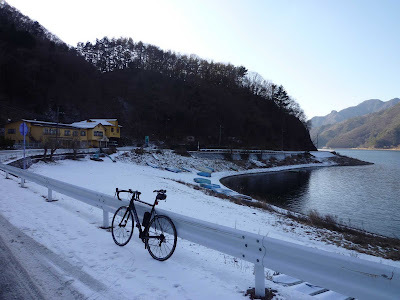 I passed by the lake on its western end and climbed up to Saiko, where I wanted to circumvent the lake against clock-wise direction, on its northern shore - i.e. against the direction of the races (and all training) there. This turned out to be not such a wise desire as there was quite some snow left on all those stretches of the road which the winter sun did not easily reach. Being used to cycle on snow from my childhood days, I rode through all the snow and ice patches, but with such thin tyres without any kind of profile, it stopped being fun after doing this every few hundred meters for another few hundred meters, and basically continuously once in the forest and heading up to route 139. 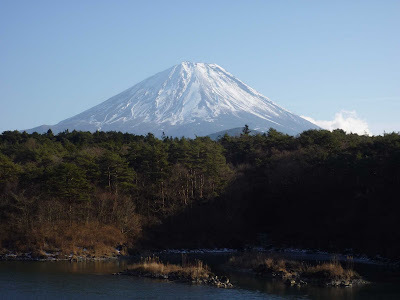 Back on route 139, the road was clear and I reached Shojiko with its great views of Fuji-san quite quickly. I then passed through the Shojiko Tunnel from where it was a fast downhill from 950m to 500m. Instead of continuing along the same kokudo straight to Kofu, I branched off into the Ashigawa valley, which basically runs parallel to the lakes I had just passed. It was completely free of traffic, and I had a large road all by myself leading up to the Torizaka Tunnel at 1,020m, just below a pass of the same name. 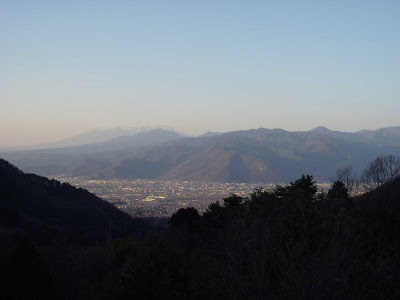 On the other side, I had stunning views of Kofu and the Yatsudake range behind it. From there, it was a very fast downhill into Kofu. At some point, I hit 70km/h, but could have gone even faster had it not been for a fear of hitting snowy and icy patches which existed here and there. 181km with 2,300m of climbing, and plenty of new discoveries, at freezing temperatures (mostly 2 to 7 degrees). Impressive pictures and even more impressive ride, a typical von Holstein non-loop mountain conquest. Glad you liked Gando-toge. Let us add this little climb in all its versions 1) the Akiyama Onsen approach - starting from the Welcome Arch, (2) the Kubo approach from Doshimichi up (3) the Nohara approach also from Doshimichi up and (4) the Kanami-rindo approach to our ever-growing Togebaka list. To be honest, I'm not so keen any longer on togebaka competitions. This was great when I needed to improve my performance and have some way of measuring it. And it is fine for passes which are short and which I pass rather too often to find interesting any longer. I don't particularly enjoy racing up passes still relatively new to me or very long ones (like Yanagisawa), because it is much more fun being able to stop on the way for taking photos, eating/drinking or just taking a toilet break. I didn't recognise you, but I clearly saw you! Thought you were part of that group. BTW, I think you took the steeper of two roads down to Doshimichi. I came up Nohara Rindo, which branches off to the left just below Gando Toge. I assume you went right on what looks like the "main" road. Who's in for a little Miura Loop tomorrow?